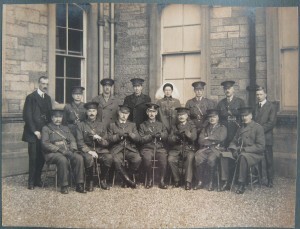 During the current centenary of the First World War, LHSA has received a number of requests for records of patients in the many military hospitals in and around Edinburgh: from Red Cross auxiliary hospitals to specialist units and existing medical facilities that were requisitioned by the authorities. 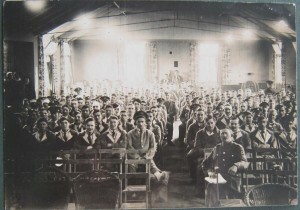 Due to the fact that medical records of service patients were returned to the custody of the Public Record Office in London (many of which were subsequently destroyed in a Second World War bombing raid), we are unable to help with these enquiries, even if we have custody of patient records generated by requisitioned local hospitals in peacetime. 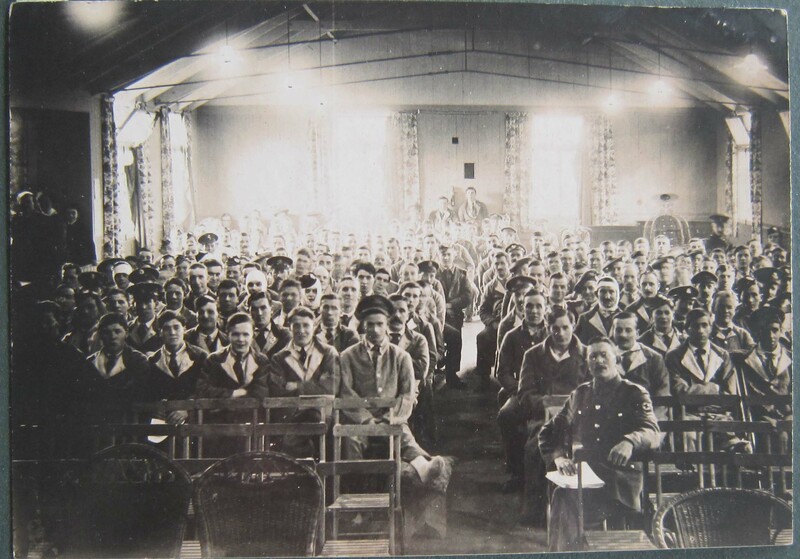 If you are researching the individual records of a forces’ patient or member of military medical staff, there are some resources that may help you at the end of the blog. However, LHSA holds a number of privately donated resources that uncover the realities of hospital life for First World War patients and medical staff alike, supplementing the ‘official’ military record. 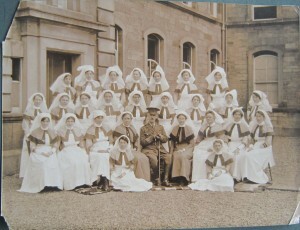 One of Edinburgh’s military hospitals was the Second General Military Hospital, Craigleith. 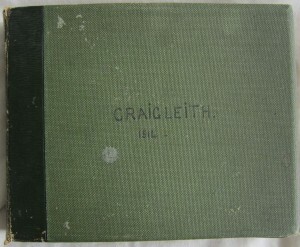 The hospital was run by a Territorial Unit, who requisitioned the hospital wing of the Craigleith Hospital and Poorhouse. 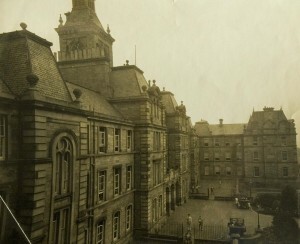 The first patient was received as early as August 1914, and the hospital was handed back to Edinburgh Town Council in Spring 1919. 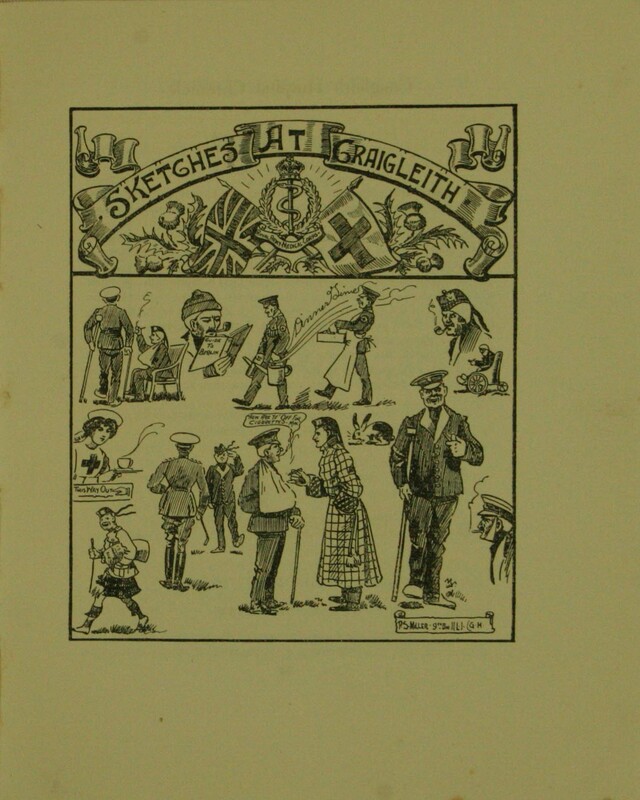 When the Local Government (Scotland) Act (1929) came into force, control of poorhouses and poorlaw hospitals transferred to the municipal authorities. The poorhouse at Craigleith became an institution that is still very much alive today – the Western General Hospital (WGH). LHSA is lucky enough to hold a number of items that bring the days of the Second General Military Hospital more sharply into focus for researchers. In addition to his specialism of gastroenterology, WGH Consultant Dr Martin Eastwood was also a hospital historian – in 1995, a book on the development of the WGH was published, written by Eastwood and his secretary, Anne Jenkinson. The sources used by Dr Eastwood were donated to us in 2009, and form a largely visual collection on the history of the hospital, starting from its opening as a poorhouse in 1867. 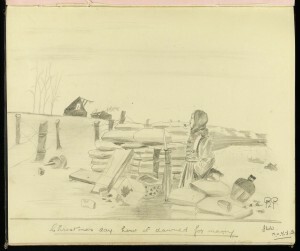 Among Dr Eastwood’s donation was a photograph album from the Second General Military Hospital. 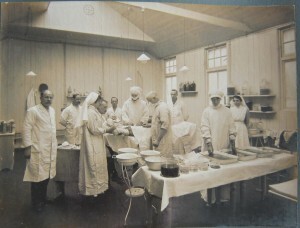 We do not know who gave the album to Dr Eastwood, but its images give a unique insight into hospital life. 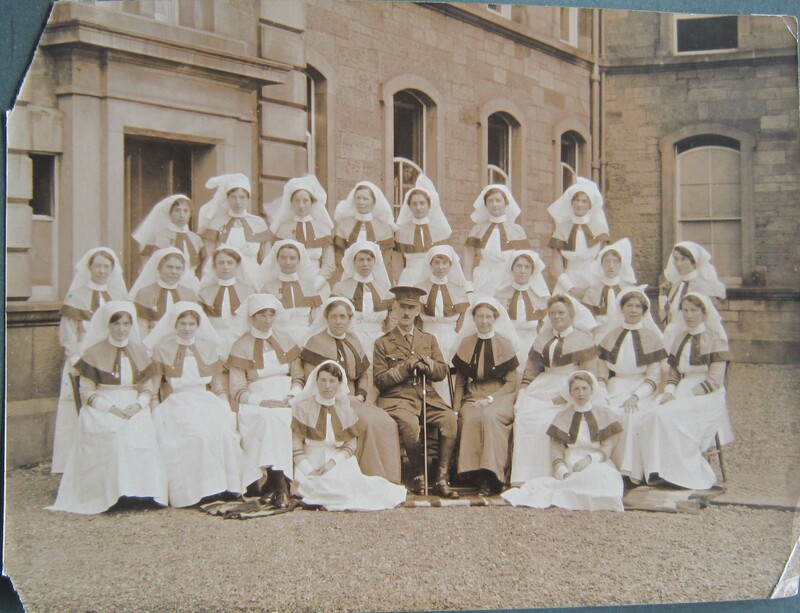 If you’d like to guess the identity of M.T.F, the excellent nursing history website Scarlet Finders lists all Scottish Women’s Hospital nurses. Unless patients signed articles or poems in the Chronicle, we have little idea of who they actually were from the material that we hold at LHSA. 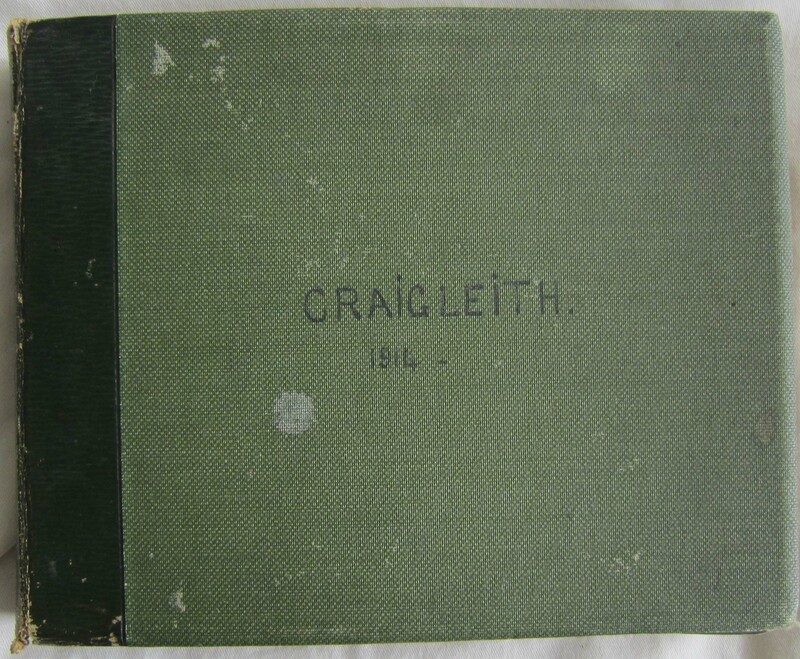 Fortunately, we do hold another piece of evidence in an autograph book created by Craigleith nurse Sister Ethel Miller from 1916 to 1919. 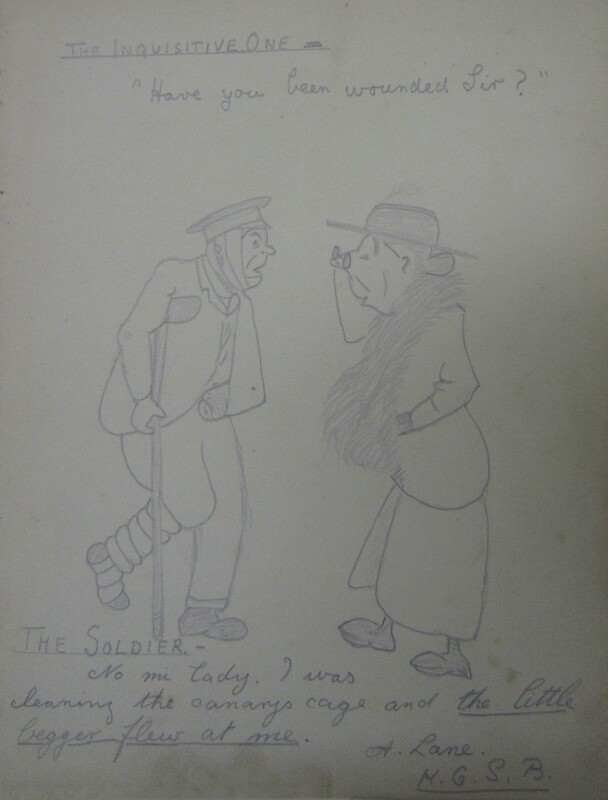 Rather than the celebrity signatures that fill autograph books of the modern day, these small volumes were passed from nurses to soldier patients on the wards, who contributed sketches, cartoons, anecdotes and poetry. 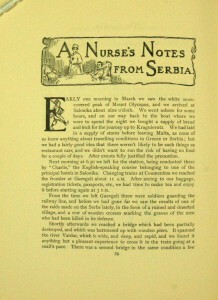 Keeping these books appears to have been common practice for nurses, and many survive in archive collections across the United Kingdom (including this one in the National Museum of Scotland). 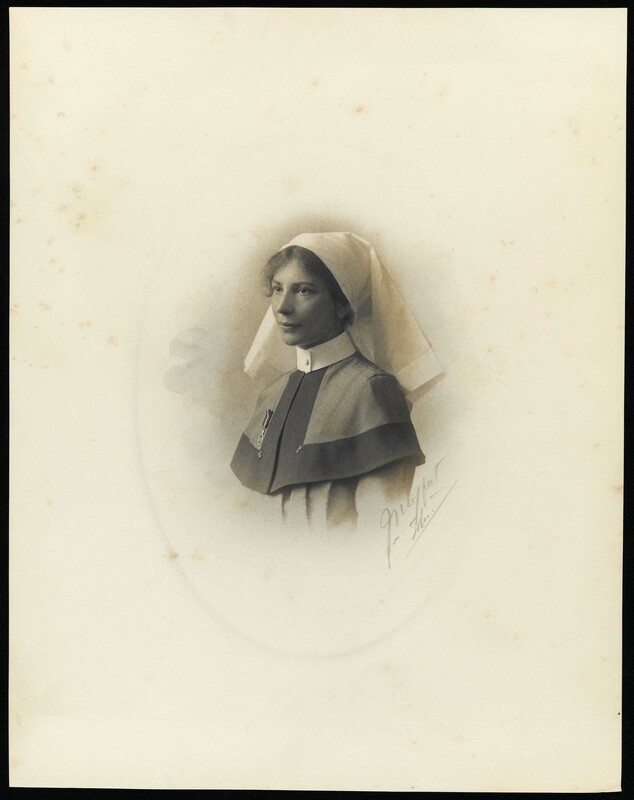 Born in 1888 in Edinburgh, Ethel was a professional nurse before the war, qualifying from the Royal Infirmary of Edinburgh School of Nursing and from the wartime Territorial Nursing Service in 1916. 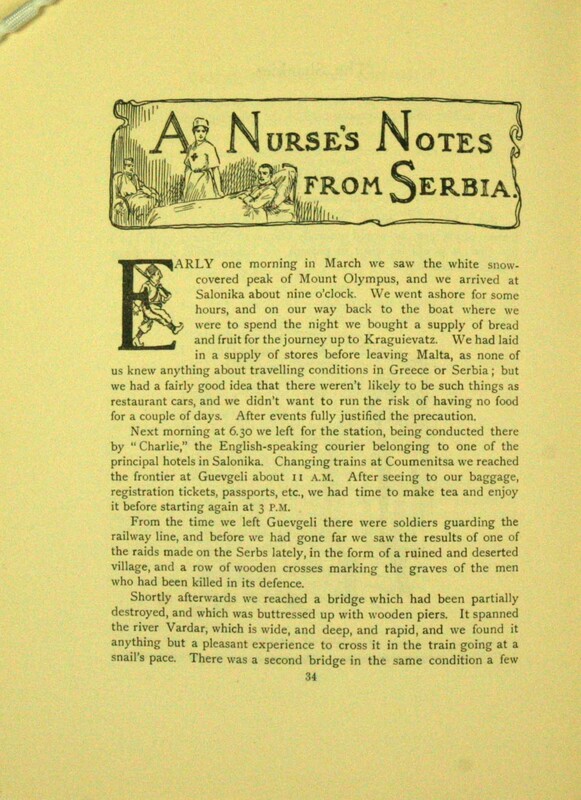 Along with photographs, printed material and nursing certificates, Ethel’s scrapbook was generously bequeathed to LHSA in 2012 by her son. 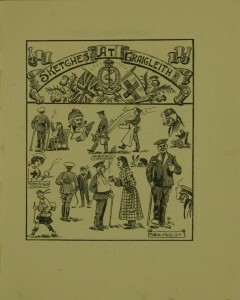 Although not all of the completed pages are signed, there were at least 43 different contributors. 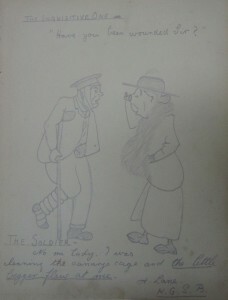 The soldiers (for the contributors were largely from the army) wrote poems, limericks, drew original cartoons, traced published images with blotting papers and sketched regimental badges and front-line experience. 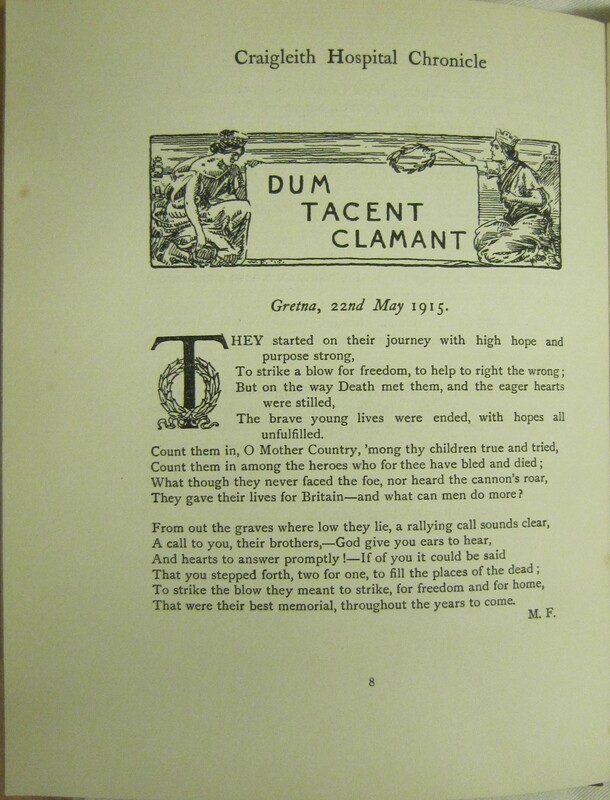 Some praised the bravery of their regiment, as did Private A. 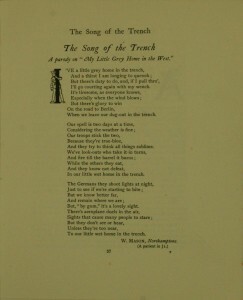 Lane of the Kings Own Scottish Borderers in October 1916, which was ‘a credit to his friends and a terror to his foes’. 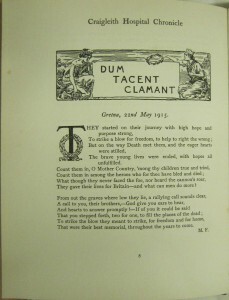 However, the main themes of the book do not concentrate on heroism on the field of battle, but on war’s drudgery and the after effects of conflict, whether that was the domestic regimes of hospital life, reaction from civilians at home to returning war wounded (as new technologies of battle left maimed soldiers as physical reminders of the effects of war) and the misery of life in the trenches. 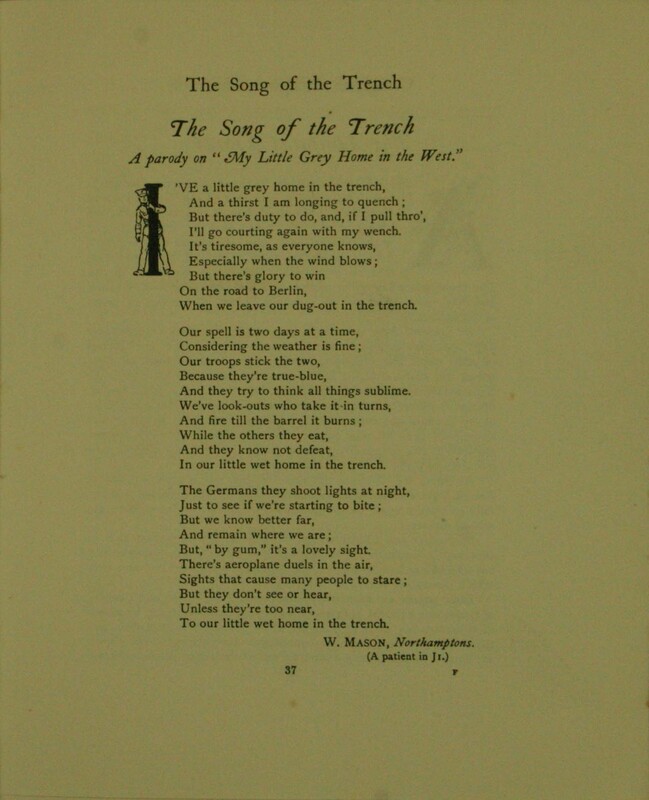 In 2013, LHSA Research Intern Kirstin Cunningham saw the potential of Ethel Miller’s book for use in education, as an object that could bring the war directly to students through ordinary soldiers’ experiences. As a photography and film graduate, Kirstin painstakingly re-created the scrapbook page by page through digital imaging, fixing each image into a modern, similar sized book that she distressed to resemble its original. 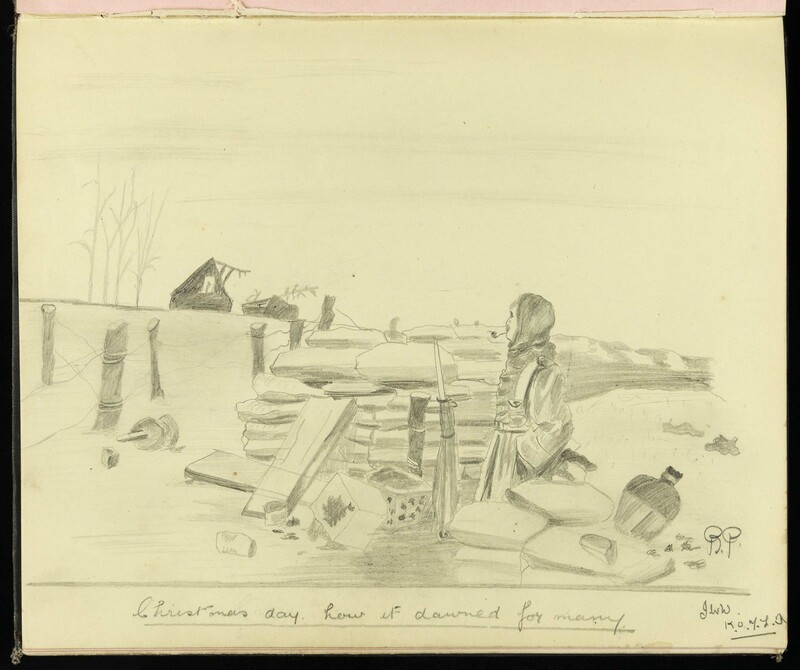 Soldiers’ stories can now be literally taken out of the archive, even if we will never know all of their names. This entry was posted in Uncategorized by lwillia5. Bookmark the permalink.